Aguilafuente is, without a doubt, a locality with an important historical past, due to the existence in its municipal term of numerous deposits. To all this are united the multiple historical events that were developed in medieval and modern times and that have endowed the municipality with an important historical projection. The first human manifestations in what at the moment is the municipal term of Aguilafuente go back to Neolithic, as it is clear from the finding of a polished ax. 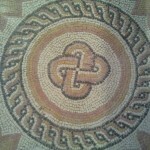 This finding is currently deposited in the Museum of Segovia and has a chronology around the 3,500 years BC. 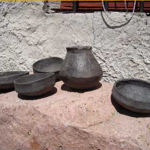 However, it is the Final Bronze (1,200-750 BC) the prehistoric period best represented in the locality, due to the presence of multiple deposits in its term such as Las Horcas, Carratejera, La Guarnecida, but above all, La Pencona, with Findings of decorated ceramics, and El Arenero (Cuesta de La Ribilla), where were found some valuable ceramic remains made by hand. The town of Santa Lucía contains mosaics, wall paintings and abundant ceramic material, in which the fragments of terra sigillata Hispanic late, as well as common ceramic, stand out, which indicates the presence in this area of â€‹â€‹a mansion whose owner boasted the Ownership of a large landowner. Other deposits of the period are found in the area known as Los Valladares and again in La Guarnecida. The province of Segovia is lavish in finds of the Visigothic people, as evidenced by the Visigothic necropolis of Duratón, Castiltierra, Ventosilla and Tejadilla, Espirdo, Madrona or Aguilafuente. In our case, the necropolis was discovered during the excavations of the town of Santa Lucia, overlapping with the already abandoned remains of the Roman building. 198 excavations were found in the excavations, of which just half (99) had some kind of funerary trousers, highlighting the fibula, belt clips, necklaces, earrings, rings and earrings. Already in the Middle Ages we must locate at the end of the eleventh century, when Aguilafuente is probably repopulated, once guarnecida all Castilian Extremadura after the conquest of the Kingdom of Toledo by Alfonso VI in 1085. Shortly after the locality appears in some documents of centuries XII and XIII, between which we should especially point out one corresponding to 1137 in which a toponym is denominated denominated Baguilafont, being this the first time in which appears the name of that derived the Current denomination of the municipality. 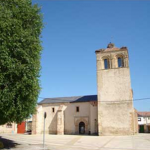 In this medieval context, the two existing churches were built in the town: San Juan (12th century) and Santa María (13th century). The 15th century was undoubtedly a century of splendor for Aguilafuente, due both to its strategic position within the travel routes of the Castilian monarchs. 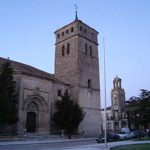 During the reign of Enrique IV of Castile, from the 1 to the 10 of June of 1472 is celebrated in the Church of Santa Maria a diocesan Synod summoned by the bishop Arias Dávila. The Synod Acts and the account of the events that took place during the 10 days that lasted gave rise to the publication of the book called "Synod of Segovia" or "Synodal of Aguilafuente", considered a bibliographical jewel because it is the First book printed in Spain. This incunable is in the museum of the Holy Cathedral Church of Segovia. In some of the final years of the fifteenth century (1489, 1492, 1496 and 1497) Aguilafuente is home to several General Councils of the Mesta, the powerful grouping of sheep farmers of the kingdom, which reflects without doubt the importance that reaches the village In that century of transition towards the Modern Age. It participates the town in the War of the Communities against the emperor Carlos I, reason why perhaps this fact motivates to the Cabildo Catedralicio to leave of her, selling it to D. Pedro de Zúñiga, Duke of Béjar, 22 of October of 1536. Shortly after Felipe II grants to his son the title of Marquess of Aguilafuente. This fact and the decadence of the monarchy of the Austrias at that time considerably affect its development. Some of the inhabitants of this town intervened in the conquest of America, as Alonso del Rio, as the conqueror Bernal Diaz del Castillo relates in his True Story of the Conquest of New Spain. In the War of Independence of 1808 with the entrance of the troops of Napoleón, given the extension of the pine trees that surround the town, the population participated very actively in the guerrilla war against the invader. Already in the 20th century, and specifically in the period of the Civil War (1936-1939), Aguilafuente was framed in the so-called national zone, like most of Castilla la Vieja. Later Aguilafuente, after the war and after the war, suffered the horrible consequences of immigration to the big ones, thus experiencing the phenomenon of the aging of the present population.